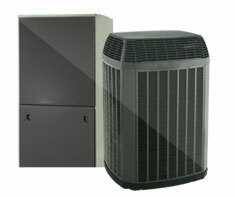 A HydroAir System is a type of HVAC system for home heating and sometimes cooling. The heat source in a HydroAir System is a Boiler, that is generally gas or oil-fired. After the water is heated in your Boiler, it passes into an air handler that has a fan in it that transfers the heat from the hot water piping to the ductwork that circulates the hot air around your home. If you have a HydroAir System, then you should also put a checkmark for either 'Gas Furnace or Boiler' or 'Oil Furnace or Boiler' in your Home Wizard app, depending on whether your Boiler is fueled by gas or oil. The air handler can also be integrated with a central air conditioning system for cooling your home. If you also have Central Air Conditioning with your HydroAir System, then you should also put a checkmark for Central Air Conditioning as a home feature for your home in your Home Wizard app. Shown in the 'Routine Care' section are the recommended routine maintenance tasks for your hydro-air system. The 'Q & A' section shows answers to common questions. And the 'Articles' section provides helpful articles about your hydro-air system.